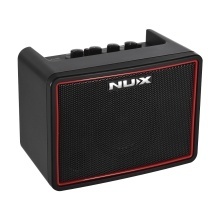 NUX Mighty Lite BT guitar amplifier features 3 channels, built-in digital reverb and delay effects, user-friendly interface design. It also offers an Auxiliary line-in and BT connection for jamming along to your own music. You can improve your jamming skill along with built-in drums and metronome as well. What&apos;s more, you can use the amplifier with NUX "Mighty Lite" mobile application. Compact size desktop guitar amplifier with 3W output power, lightweight and portable, suitable for indoor and outdoor use. Features 3 channels(Clean – Overdrive – Distortion), built-in 2 effects(Delay – Reverb), 9 drum patterns and 1 metronome, allows you to create any music style sound you like. You can connect music player/ smartphone via 3.5mm AUX IN jack or BT connection to play your guitar along with background music; and the 3.5mm headphone out for silent practice. Tap Tempo controls delay speed and drum speed; supports input signal level(GAIN), output volume(VOLUME) and TONE adjustment. 3 ways of power supply for selection: DC 9V power adapter(included), 6 * AA batteries(not included), or USB connection via power bank(not included). Batteries and USB power cable are not included. Guitar showed in the picture is not included. Users can download the "Mighty Lite" APP for Android or Apple device from Android supports page or Apple Store.